Much of India is surrounded by ocean and the country has some incredibly scenic beaches that offer everything from solitude to parties. The best beaches in India can be found on the west coast, with Goa being the most famous beach destination. However, there are other places to consider as well, especially if you want to get away from the tourist trail. Here's where to go. Varkala beach lies about 45 minutes north of capital Trivandrum in Kerala, and provides a relatively peaceful alternative to the now commercialized Kovalam. The setting of this beach is striking enough to take your breath away, with a seemingly endless paved stretch of cliff bordered by shacks on one side and views that extend over the Arabian Sea on the other. It's an excellent place to rest and rejuvenate, with yoga and Ayurveda being popular there. Think Goa has become too overcrowded and commercialized these days? Gokarna is a small and remote holy town in northern Karnataka, with four of India's most secluded beaches nestled nearby. It draws both pious pilgrims and laid-back travelers with equal enthusiasm. Go there to get a feel for what Goa was like in its heyday, although time is limited as developers are already seeing the potential of this area. Palolem Beach, enclosed by a thick forest of coconut palms in far South Goa, is arguably the state's most picturesque beach. This mile-long, semi-circle shaped beach continues to grow in popularity every year. It's the most lively beach in the area but still retains its relaxed vibe, as permanent structures aren't allowed to be built on it. If you can't make it to the Andaman Islands, the vicinity of Tarkarli beach in southern Maharashtra has one of the best coral reefs on the Indian mainland. This area is yet to feature on the tourist trail and receives hardly any foreigner visitors. The simple homestay accommodations right on the beach are a delight. Locals can often be seen unhurriedly riding bicycles or walking to get around. Agonda Beach in South Goa is perfect for those looking to get away from it all. Stay in a hut right on the beach, and enjoy the stillness and serenity. The rear of the beach is lined with shacks and small shops but apart from that, there's not much else to do there apart from eat, drink, swim, and chill. Transformed from sleepy fishing village to the trendiest beach in Goa, Arambol has really started attracting the crowds (unfortunately, perhaps to the point of saturation). It still has a traveler vibe though, with live music and jam sessions on the beach, and plenty of alternative therapies such as meditation, yoga, tai chi, and reiki. It's possible to walk south from Arambol to quieter neighboring Mandrem beach. The original hippies may have moved on but that doesn't mean the party is over at Anjuna. Legendary shacks Curlies and Shiva Valley still hold parties, on Thursday and Tuesday nights respectively. Nyex Beach Club has replaced Club Paradiso, and is split over three levels with a swimming pool in the center. Anjuna is also close to Hilltop, where big trance parties are usually held on weekends and New Year's Eve. Their Facebook page has the details. Anjuna has plenty of backpacker hostels where you can stay cheaply and socialize with other travelers as well. 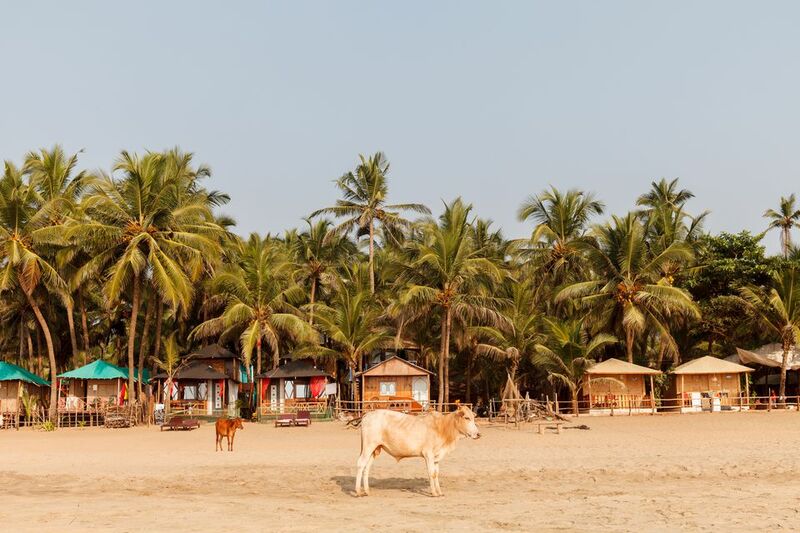 For sure, Baga Beach in North Goa may be commercialized and busy but for those who like action, it’s one of the most happening beaches on the coast. Water sports, para sailing, beach shacks, bars, clubs, and fine dining restaurants -- you’ll find them all there! Theses days, Baga attracts a predominantly Indian crowd, who come for the mainstream music and discount drinks along Tito's Lane. The most developed of Kerala's beaches, Kovalam is located not far from Trivandrum. It's made up of two coves -- Hawa (also referred to as Eve's beach) and Lighthouse. Lighthouse is the biggest of the two, with its promenade lined with open-air restaurants. The lighthouse atop this beach provides fantastic views, especially at sunset. In addition, it's something of interesting for kids to learn about. Kovalam is also one of the best beaches in India for surfing, and there are water sports too. Once voted Asia's Best Beach by TIME Magazine, Radhanagar Beach is situated on Havelock Island in the Andaman and Nicobar Islands, which are sprinkled across the Bay of Bengal. The islands are a Union Territory of India. Radhanagar Beach (also referred to as beach number seven) is renowned for its calm, still water and fine white sand. Pondicherry, with its pervasive French heritage, is a union territory on the coast of Tamil Nadu in east India that's ideal for culture vultures. The historic French Quarter in town is a highlight, while nearby Auroville and Paradise beaches are great for swimming. Also check out the pristine beaches at Mahe, Yanam and Karaikal -- also part of the Union Territory of Pondicherry. Notable for being the longest Drive-In Beach in Asia and one of the best beaches in the world for driving, Muzhappilangad lies between Kannur and Thalassery in northern Kerala. This crescent-shaped beach extends for about 5 kilometers (3.1 miles), and it's possible to drive for 4 kilometers (2.5 miles) directly on the sand. The beach is protected by giant black rocks that keep the surf gentle. Other attractions are boating, water sports, and adventure sports such as paragliding, parasailing and microlite flights. Getting there is easy now that a new airport has conveniently opened up in Kannur. Listed by Lonely Planet as one of the world's most unusual beaches, Chandipur is unique in India for its disappearing sea. At low tide, twice a day, it recedes for up to five kilometers (3.1 miles)! This means you can explore the seabed, having fun chasing red crabs and collecting shells and driftwood. Chandipur is located in Odisha's Baleswar district, just under four and a half hours north of capital Bhubaneshwar.